I invite you to be partners in the publishing of PhotoSophy, a photographic album where both my worlds – philosophy and photography – meet. The book PhotoSophy is a photographic album where the two worlds of the philosopher and photographer Pierre Poulain link to form one unity from which emerge a dialog, a tension between image and text. The book contains 21 photos by Pierre Poulain, accompanied by philosophical texts. Pierre Poulain started his way as a street photographer at the age of 20 in France and has been practicing Photography and Philosophy as a daily way of life, for over 40 years now. Pierre lectured and exhibited solo exhibitions in many cities around the world: Paris, Madrid, Lisbon, Marseilles, Bilbao, Johannesburg, Mumbai, Tel-Aviv, Seoul and many more. He was invited by the Israeli Foreign Ministry to Canada and Ecuador, to promote cultural dialogue in those countries. Pierre has written various books that inter- link Philosophy to Photography. Amongst his books are: ” Wisdom Through the Lens”, “The Artist, the Dreamer and the Warrior”, “Questions from Life” and “After the fall, History Continues”. Last year Pierre has developed the concept of PhotoSophy while meeting the curator Shuki Kook and exhibited the first, unique exhibition to link these two worlds. 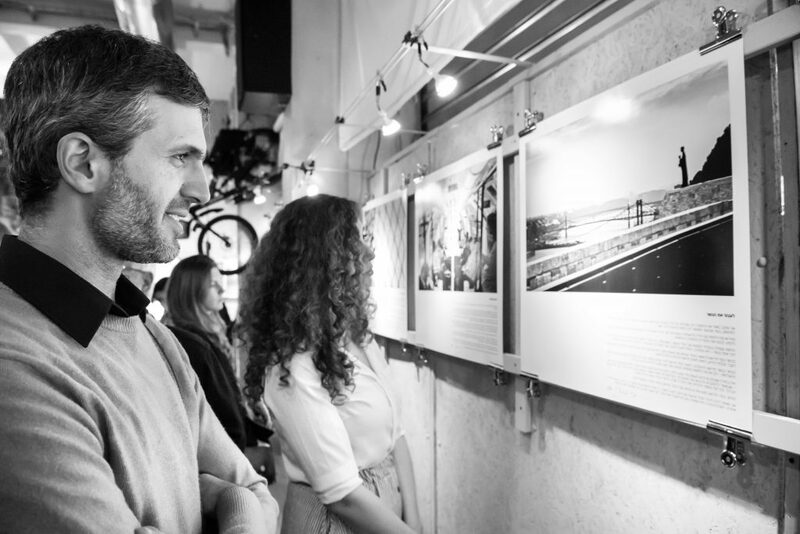 PhotoSophy’s first exhibition took place in Tel Aviv in December 2017 and it continues to be exhibited since, in various places around the country. Behind every photo there is a Philosophical idea, a deep attraction to life. The text does not explain the image, neither the image illustrates the text. They are both part of the creation and together, without explaining one another, they create a whole. Life is always the One which is Whole. The combination of the photograph and the text, enables me to bring this whole, the tension, the mystery, the paradox and the question mark. The book is an invitation to enter the enigma of creation and investigate the enigma of life. The book will be published in a large, high quality format, complied with 11 articles about Art and Philosophy, written especially for this opportunity. In addition, the book includes texts by special guests, artists and philosophers, from various countries. Thank you all for taking part in this project! Supporting the production of the book. An act of trust, support and contribution to the production of the book. It’s possible to contribute any sum. The printed book, to be collected personally or send by mail to your home. Two printed books, to be collected personally or send by mail to your home. To be chosen from the variety of the exhibited photographs. Each photo is the size of 60X60 and is printed on a “Traditional Art Paper". The price includes delivery to your home.